Betws-y-Coed is surrounded by the Gwydyr Forest in the breathtaking scenery of Northern Snowdonia. It is easily accessible from the A5, A470 or A55 making it a great location to base yourself for a Mountain Walking holiday to remember and Bryn Bella is ideally situated for Mountaineers of all abilities. Do you ever wonder what the view from the top is like? Or do you just want to experience the mountains at a leisurely pace. Whatever your motivation, Snowdonia is the perfect place for you with a variety of walks to suit all abilities and aspirations. 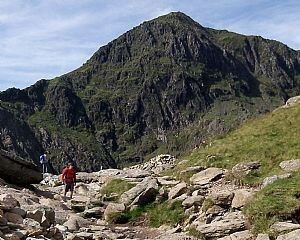 From low level river walks along the Conwy and Llugwy rivers to Snowdon, at 3,560 feet the tallest mountain in England and Wales. Whatever you motivation or fitness level there will be at least one walk you can do whatever the weather. 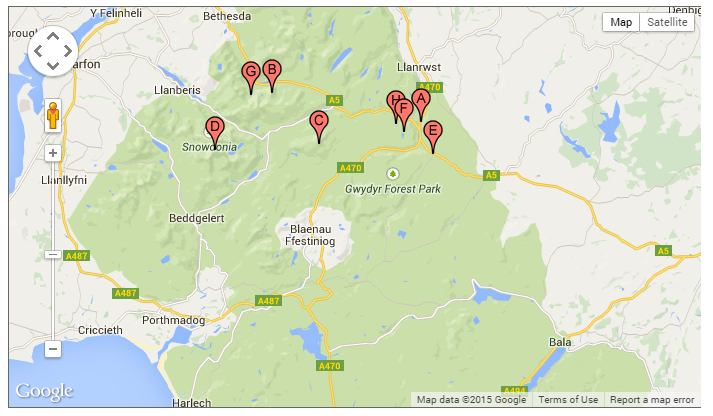 At Bryn Bella we pride ourselves at knowing our way around the mountains of Snowdonia. With many years of practical experience walking and climbing in the area as well as a plethora of guide books we are able to point you in the direction of a good day out whatever the weather. 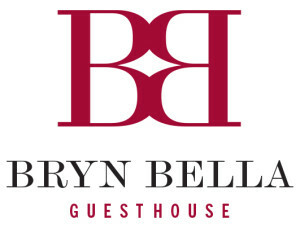 Remember even if you do get wet, or should it be “WHEN” you get wet, Bryn Bella has adequate drying facilities for your boots and clothes and hot water a plenty for that all important shower when you return. So whether you are a complete beginner who just cannot wait to get out on the hill or an experienced walker looking to hone your skills in navigation, scrambling or winter mountaineering, Bryn Bella is the place to base yourself as we can assist you in your needs. We have teamed up with Snowdonia_Adventures for all your walking, climbing and coaching requirements, just follow this link to Snowdonia_Adventures and start planning your next adventure. The location of points of interest are shown below. Use the ‘Satellite’ button to get an overhead photo of the locations (best if zoomed in first).